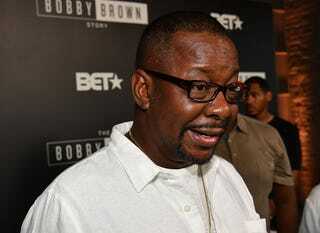 Bobby Brown is looking for big bucks from the producers of 2017 Whitney Houston documentary Whitney: Can I Be Me. According to the Hollywood Reporter, Brown and the estate of his daughter, Bobbi Kristina Brown, have filed a $2 million complaint against Showtime and BBC, alleging the documentary about his late ex-wife used footage of Brown and his children without obtaining their consent for release, including footage from his Bravo series Being Bobby Brown. …Several other defendants were also sued. Among the defendants in the case is dissolved Being Bobby Brown production company B2 Entertainment, the Hollywood Reporter writes. This isn’t the first time Brown has sued over a film about his family. Last year, he filed a lawsuit against TV One over a biopic about his late daughter. In that instance, his portrayal was as much at issue as his consent to be in the film. The biopic depicted him as a neglectful drug user. The lawsuit was ultimately dismissed. Fans are constantly raising questions about portrayals of Bobby and Whitney in the numerous documentaries and biopics that have been produced since Houston’s death. For example, many found Bobby’s portrayal in recent biopic The Bobby Brown Story too sympathetic, despite heavy praise for actor Woody McClain. Similarly, while I have no issues with actress Gabrielle Dennis, I literally kept forgetting she was supposed to be Whitney Houston. All this is to say that a documentary about Whitney’s life without the added melodrama, sensationalism, and artistic flair of a biopic was certainly not a bad thing, in and of itself. Anyway, we’ll see what happens with Brown’s latest suit.